Zee Marathi is ready to launch the sixth season of Saregamapa within three years of the inception of the popular music reality show on the channel. Following the success of the recently concluded Saregamapa Li’l Champs, the channel will launch the next season Saregamapa – Maharashtra Cha Aajcha Awaaz on 30 March. The show will have 10 established Marathi singers – five males and five females – as contestants. Noted music composer Pt Hridaynath Mangeshkar and Suresh Wadkar will be donning the judge’s hat this time. Hosted yet again by Pallavi Joshi, the show will be back at the Monday-Tuesday 9.30 pm slot. The channel has chalked out a four-week marketing plan for the upcoming season. It will have a mix of ATL (above-the-line) and BTL (below-the-line) activities. The teasers have already started while more creative contestants and judges interviews will be carried out in later weeks. Apart from spots on network channels (Zee Marathi, Zee Talkies), there will be more then 100 hoardings across Maharashtra. The channel is investing heavily on the radio as well. “We have booked spots on all the private FM channels in the state. Right now we are carrying out plain advertisements. But in the coming weeks, radio channels will air the contestant’s and judge’s interviews as well,” added Sane. Interestingly, in print, the channel will be promoting the show mainly in the smaller newspapers, to reach to the masses. From the third week, the channel will organise on-ground activities in tier-3 and tier-4 cities. They will also distribute merchandise during the events. 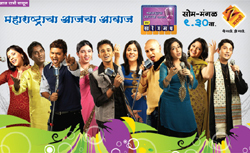 Idea has once again joined Saregamapa as title sponsor. It is also the telecom sponsor for the show. Meanwhile, Parle Agro and Lion Kashmir Honey have joined as associate sponsors. The grand finale of the fifth season of Saregamapa Li’l Champs received a TVR of 13.3 in all Maharashtra (C&S, 4+) and a reach of 27 per cent (8.46 million people), as per Tam data. Also the average time spent by the viewer was 130 minutes for the show. The channel has decided to come out with an audio CD of 10 original compositions sung by these contestants as this season’s souvenir. Zee Marathi has already published individual CDs of five finalists of last season under the name of “Panchratna”.